Cycling has been an enjoyable form of exercise & pleasure since bicycles were invented. But the days of using bikes to travel everywhere have been somewhat hindered by tarred roads. In order to get to the best cycling destinations, you might have to cross a few highways. To do this, you’ll need a top of the market bike rack to ensure your equipment reaches the end of your journey safely. So why not consider the Saris MTR 2-Bike Rack? This bike rack has everything you need from stability to durability & quality. It even accommodates larger bikes so you’re not restricted by your bike’s weight & size. If you need a fantastic bike rack that will get you from A to B in the best way possible, the Saris MTR 2-Bike Rack is an incredible choice. Still not convinced? 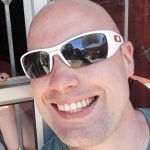 Hopefully this guide will help you. MTR stands for Modular Tray Rack and is a term used to describe the design of Saris’s newest product. Like most hitch mounts, the MTR offers a sturdy option to transport your bikes while keeping them away from your car. The greatest benefit of this type of rack is it prevents damage to either your vehicle or your bike. The Saris MTR offers something new. Most hitch mounts are made of vertical setups that require you to secure straps around the frame of the bike. Often these straps allow your bike to shift & cause them to rattle. Although it’s one of the best ways to transport your bike, this movement doesn’t grant you the confidence that more sturdy mounts might provide. The MTR solves this problem. 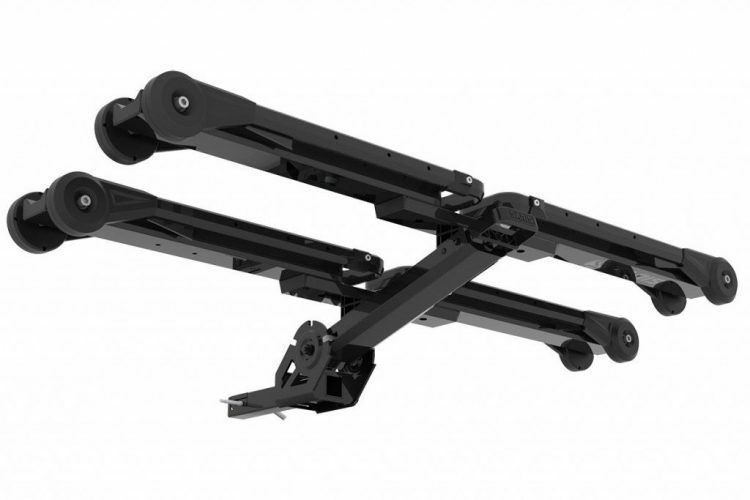 Instead of a vertical setup, this mount provides a flat surface that stretches from the hitch of the car. The wheels of the bike are clamped to this tray in a similar way to a truck or roof hitch. Why is this so fantastic? By securing the bike at the wheels, this guarantees it will be sturdier. It also prevents sway, so you have less to worry about when driving around sharp corners. The best advantage of the MTR is that it’s customizable. Many racks are only able to accommodate racing bikes and don’t account for larger wheels or frames. The MTR design, on the other hand, can be adjusted to space the bikes further apart so it doesn’t matter how large they are. Once you’re done using your bike rack, you can simply fold the MTR away so it doesn’t take up any space. Although it’s only suitable for two bikes, you can buy more trays that can easily be attached to your rack. 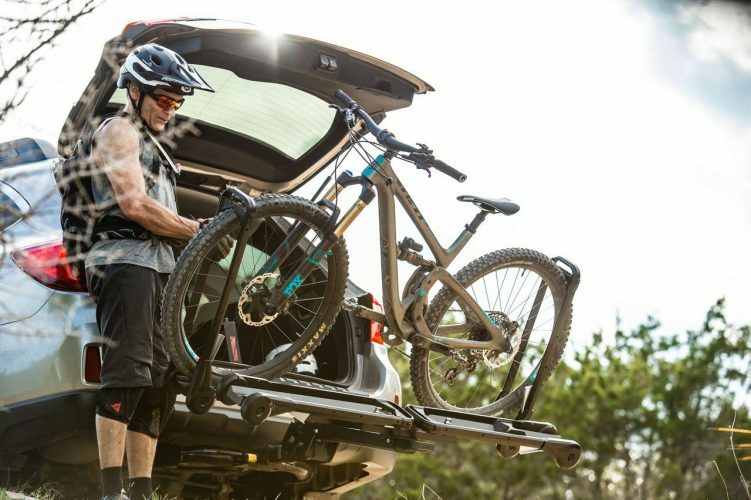 You can go as far as transporting up to four bikes onto your vehicle. It’s a wonderful new design that’s changing the way which people transport bikes. Space & stability are guaranteed and you are in complete control of how many bikes it’s carrying. The Saris MTR 2-Bike Rack is constructed from American aluminum & steel which means it can withstand a great deal of weight without bending or breaking. The result is that each slide can hold a 60lb bike. If you want to know why this is incredible, consider the average weight of a bike which is only 17lb. The Saris MTR 2-Bike Rack even comes with a lifetime guarantee. That’s how confident they are that this bike rack will last you a long time. The strong design ensures your bikes will be held in place for many years to come. 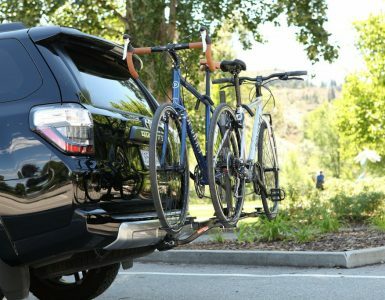 Complete integrated security not only ensures bikes will be locked in place but also secures the rack to the car. 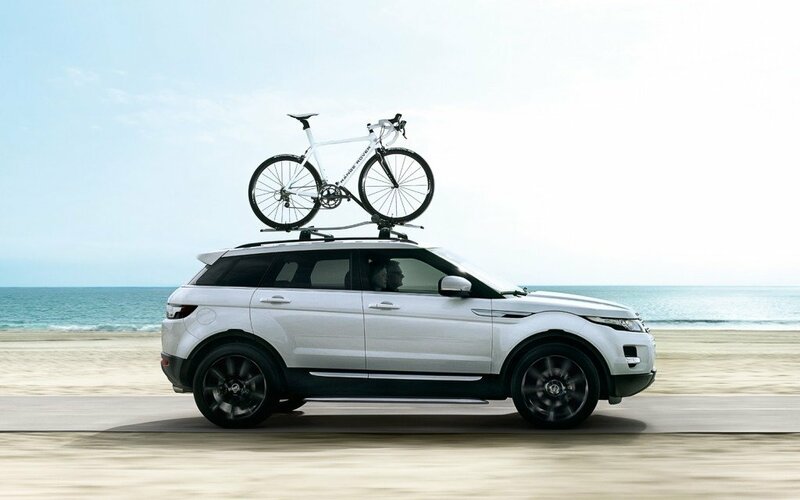 No matter what terrain you’re driving on, your bikes won’t move from their positions nor will the rack unhinge from the car. This maximizes your safety while driving keeping you & your bikes protected. The secure locking system also makes sure your bikes are safeguarded from theft. While your bikes are locked to the rack, nobody will be able to steal them. What truly makes hitch mounts so special is they can be tilted away from the hatch of your car so you can access the back without hassle. This is the reason many people prefer them to trunk mounts. The only problem is the bikes must often be removed before the rack can be tilted. With Saris’s spectacular glide design you can access your trunk without needing to unclasp your bikes. It’s all done with a dual suspension frame that allows the rack to be dipped when needed and easily lifted again. Even if you have to stop your car on the side of the road during an emergency, you can retrieve whatever you need from your trunk. It makes access so much easier. The dual arms feature is not only efficient in keeping your bikes in place but is also adjustable. This means it’s able to accommodate a wide variety of wheel sizes so it doesn’t matter what your purpose is for using your bike. 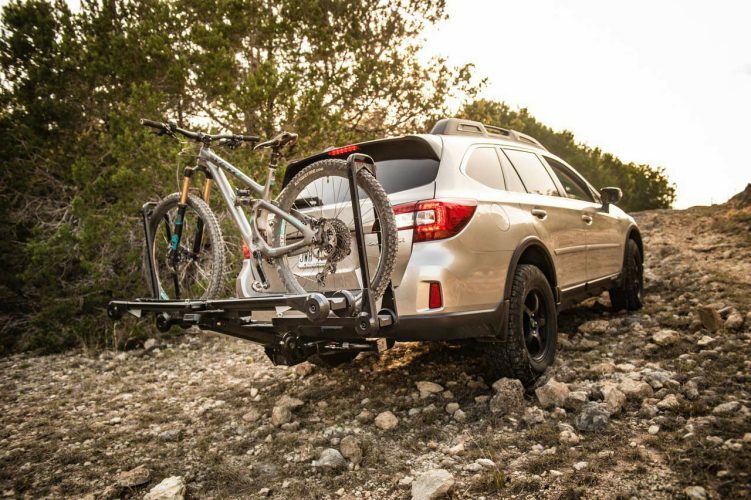 If you want to go mountain biking or track racing, this feature lets you transport any bike even if it’s a giant-sized unit. 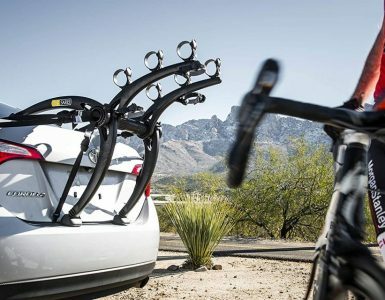 The Saris MTR 2-Bike Rack is able to carry two bikes so you can travel to the great outdoors with a friend. If you’re hoping to take your entire family on an outing, you can add two more trays to the rack in order to carry up to four bikes. This gives you an impressive means of adding more bikes to your rack without the need to buy an entirely new mount. It’s perfect for either a family vacation or a romantic getaway. Makes loading the bikes a lot simpler so you can put them on and/or take them off wherever you are. The rack is ready to use as soon as it comes out of the box. Doesn’t require any tools, so installing the mount takes very little time and is easy to accomplish. Allows the mount to fit a variety of wheel sizes from 20” to 29”. Unfortunately, the Saris MTR 2 isn’t available yet. But you don’t have to wait long. It will be released later this year in Spring 2019, so if you’re patient you’ll have one of the best bike racks on the market. Due to the MTR not being available yet, the price hasn’t been confirmed. It’s estimated at about $500 which can be a hefty amount for most middle-class families. On the other hand, it’s a very good value for a decent quality bike rack. The mount’s durable design ensures it won’t need replacing, so it’s a once off payment for something that will last you a lifetime. Due to the Saris MTR 2-Bike Rack’s ability to accommodate different bike sizes, it can cause the problem of extending too far behind the car. All this means is that you must be more aware of your vehicle’s placement in comparison to the cars behind you. As long as you’re alert, this shouldn’t be an issue. These disadvantages are all minimal issues when it’s compared to the quality of the bike rack you’re purchasing. The guarantee of stability makes it worth the wait, despite the cost & size. Although Saris offers a lifetime warranty, it’s still important to maintain your bike rack in order for it to work at its best capability. For optimal maintenance, you need to clean it with soap & water. You also need to make sure the joints are well lubricated so they move without grinding & wearing. Has the size of your bike ever been a problem when it comes to transportation? Have you ever felt that your hitch mount isn’t stable enough? With the Saris MTR 2-Bike Rack, stability, quality and space are guaranteed so you never need to ask these questions again. The Modular Tray Rack ensures your bikes won’t move once they’re locked in place. If you have larger bikes, you can space the trays apart so the entire family can join the trip. It’s suitable for all cycling needs whether you’re looking for an adventure or hoping to win the gold medal at your next race. Now you know: All your transportation needs are solved.